First of all the" Zoom" in the Nike Zoom is a lightweight extremely responsive cushioning. Nike makes the padding super thin, which brings your foot closer to the ground. This enhances your feel and in turn gives you more maneuverability. 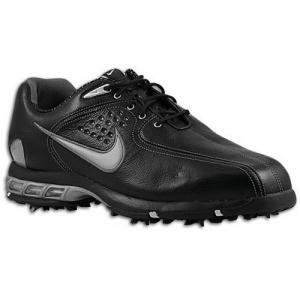 The Air Zoom Elite has full grain leather upper which makes the shoe very comfortable and keeps your feet dry. It has Nike Power Platform which gives you great traction. The liner is a Poron sockliner that adheres to the contour of your foot. Of course Nike invented the Air technology several years ago. Most of you know that this is air encapsulated in the shoe which makes for a very comfortable but snug fit. My favorite thing about this shoe is the Nike Power Channel. This power channel helps give your golf swing power by freeing up your foot for optimum balance and a smooth weight transfer. I would recommend this shoe for golfers of all levels. It is a high performance comfortable shoe at a very reasonable price.